One of my favorite parts of any party is designing the invitation! Beehive pinata. 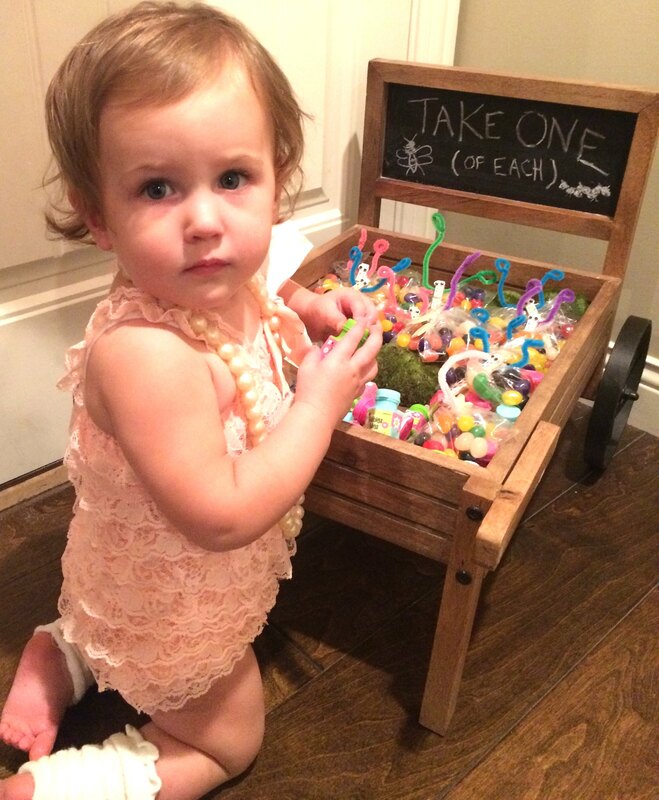 My older toddlers loved helping make this for the party! 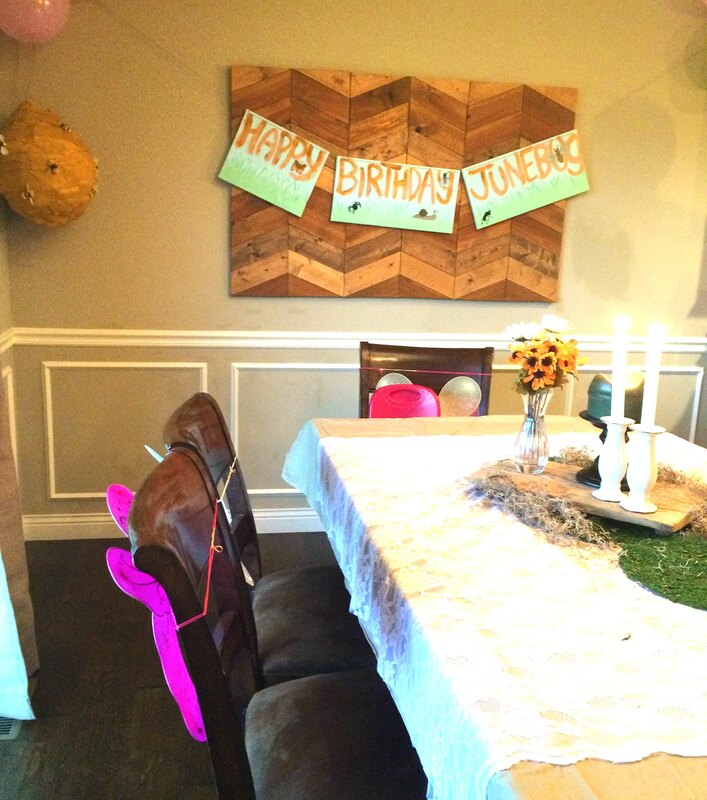 Pinata, garden birthday sign, artificial round moss mats, spanish moss, fake flowers and butterfly wings for the backs of the chairs. And I cut out some circles of old cardboard boxes with some leftover fabric to make these lovely creatures. 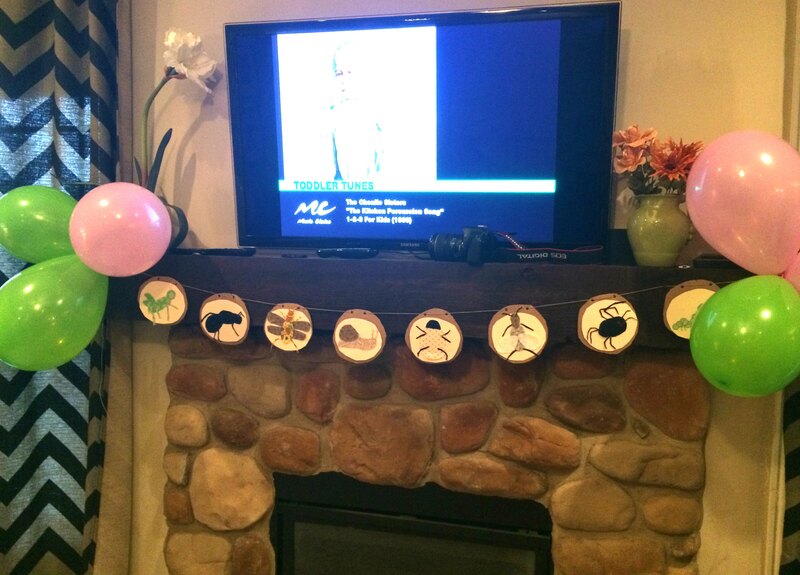 I hung these above the fireplace. They helped me bring the outdoors in, even though it was raining! Ladybug, ant, caterpillar, spider, grasshopper, fly, snail & bee. 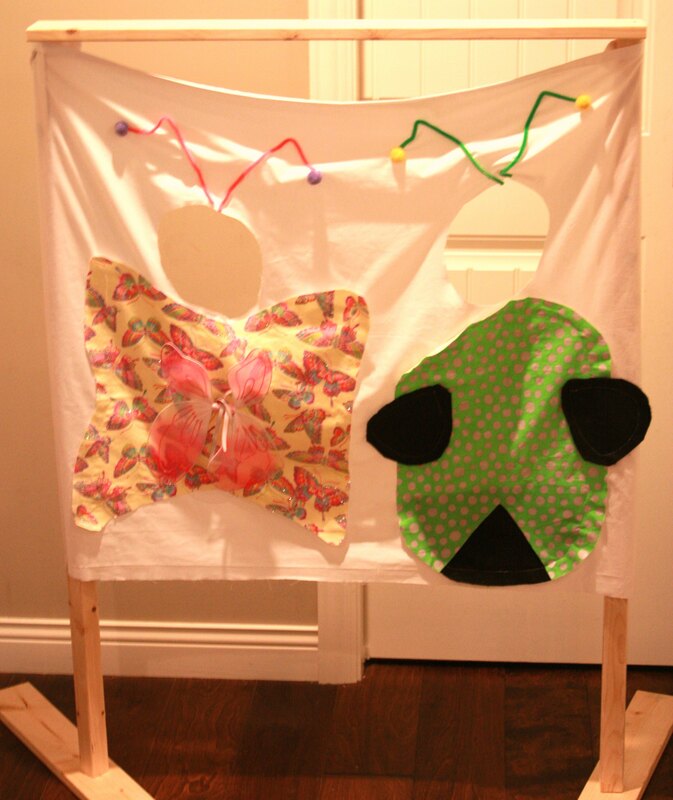 Cardboard & fabric bug banner. My husband drilled some 2×4’s together to make this bug photo booth, which I will probably use in the future by just replacing the fabric and doing something else. Me and Nana in the photo booth! Now for the grub!!!! 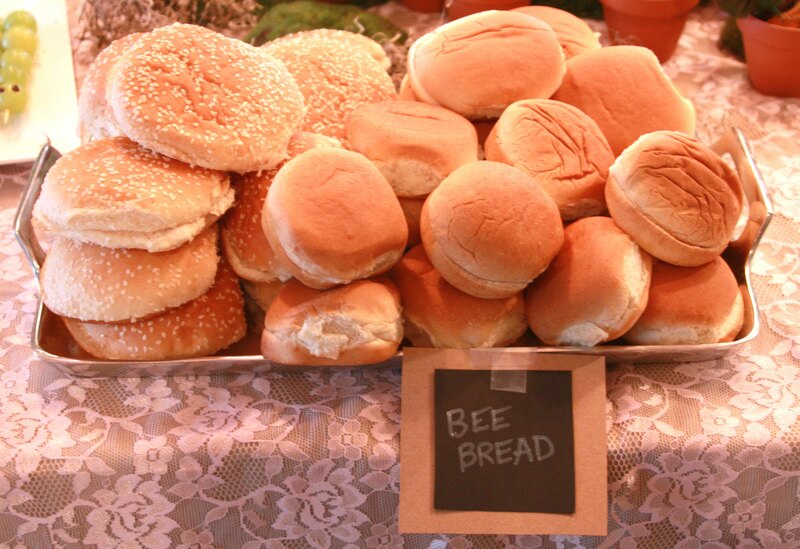 We did bug meat, bee bread, butterfly salad, snails, caterpillars, ants on a log, roly polys, ants on a hill, dirt desserts, butterfly cupcakes, beetle juice and sweet nectar. 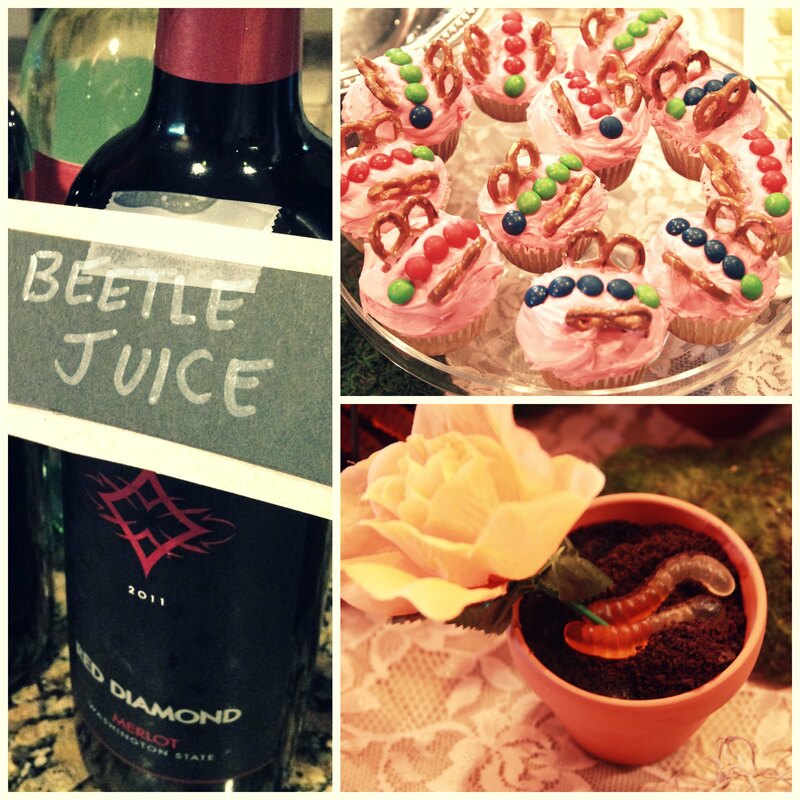 The “garden grub.” Lots of caterpillars, dirt desserts, bug meat and more! 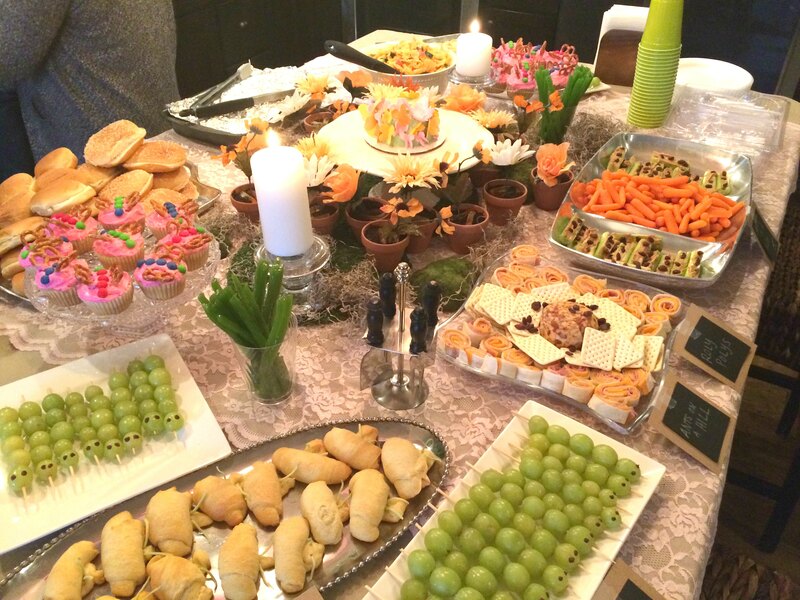 I also used green Twizzlers for grass and dried spanish moss for table decorations. The dirt desserts were kind of my centerpiece. The caterpillars (grape skewers with chocolate eyes) were a HUGE hit with the kids. 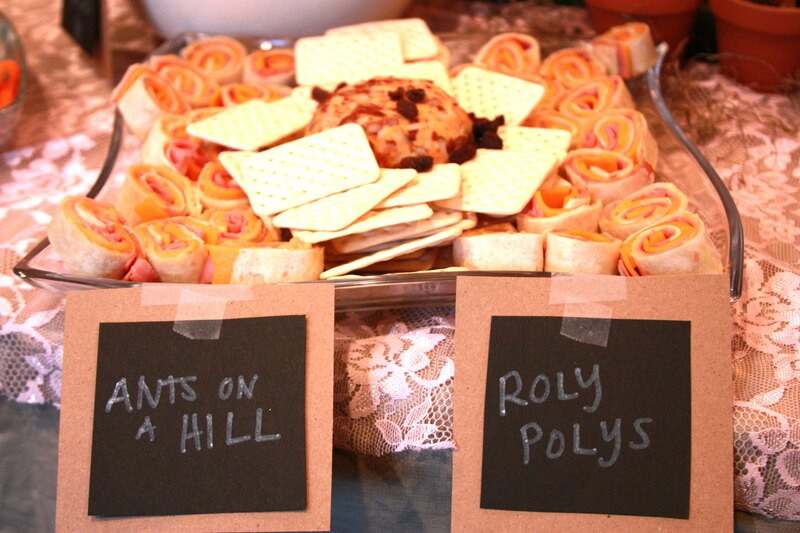 Roly Polys (ham & cheese wraps) and ants on a hill (cheese ball toped with a few raisins). 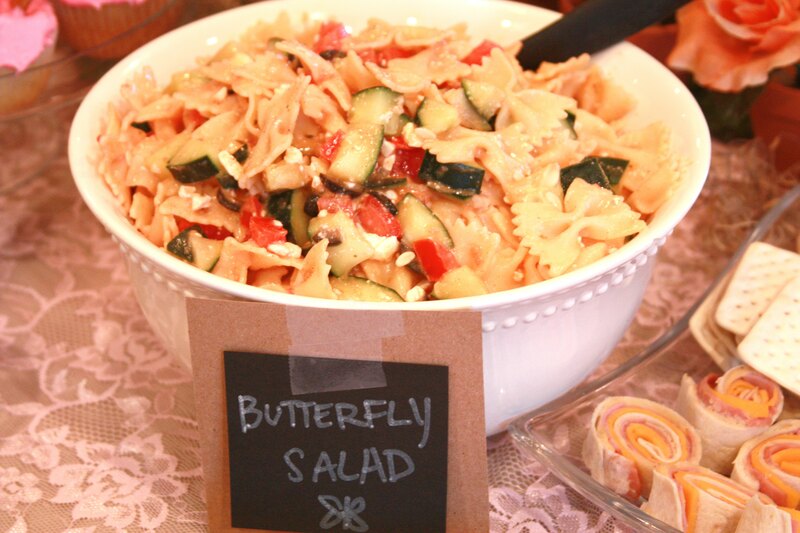 Butterfly salad (pasta salad with farfalle noodles). 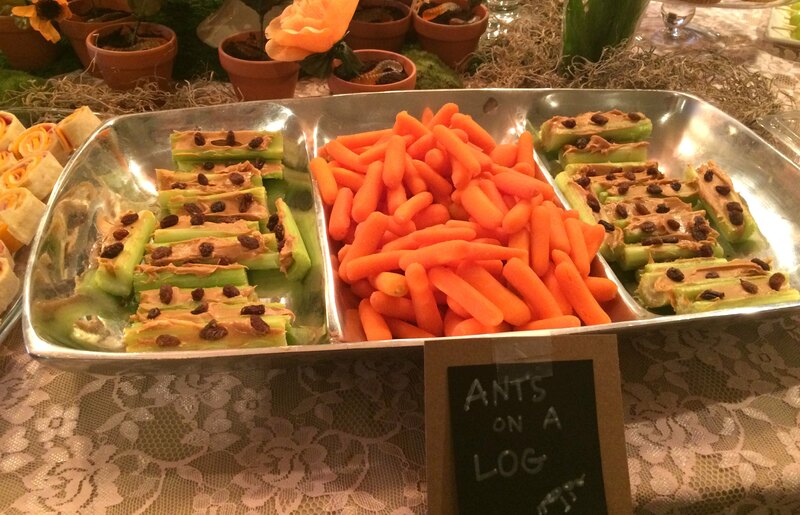 Ants on a Log (celery with peanut butter & raisins). 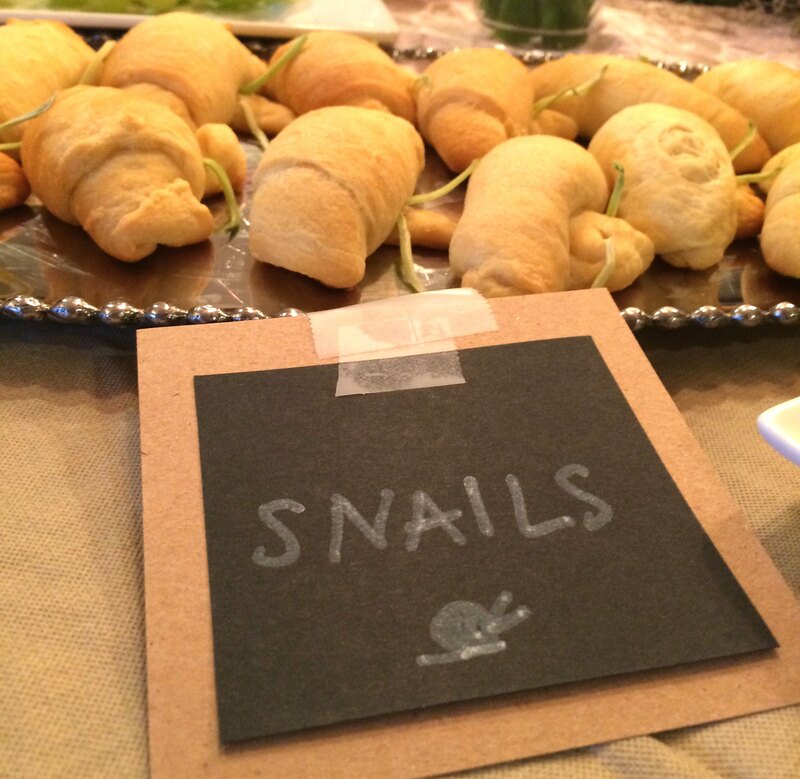 Snails (crescent rolls with broccoli slaw for antennae). 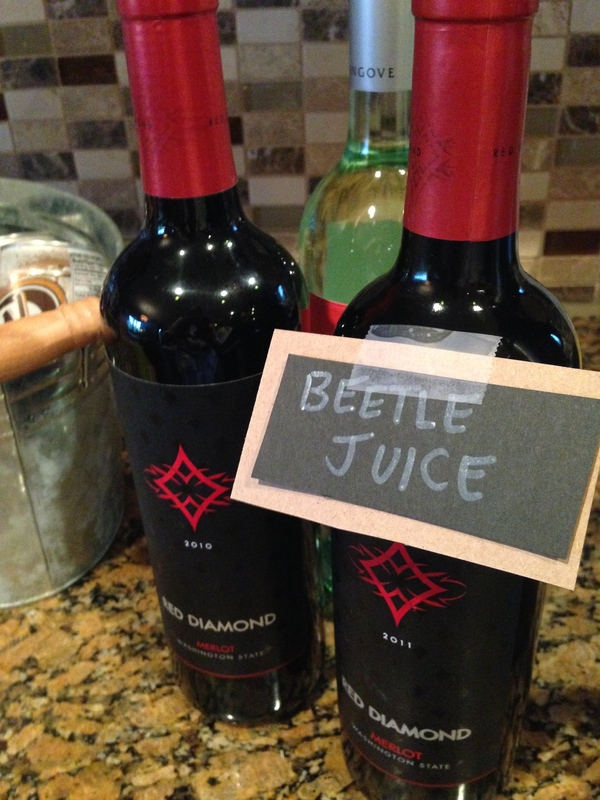 For drinks, we had some wine & juice (“beatle juice” and “sweet nectar”). Here’s a pic of the cupcakes (pretzels & skittles) and a close up of the dirt dessert (chocolate pudding, oreos & gummy worms). 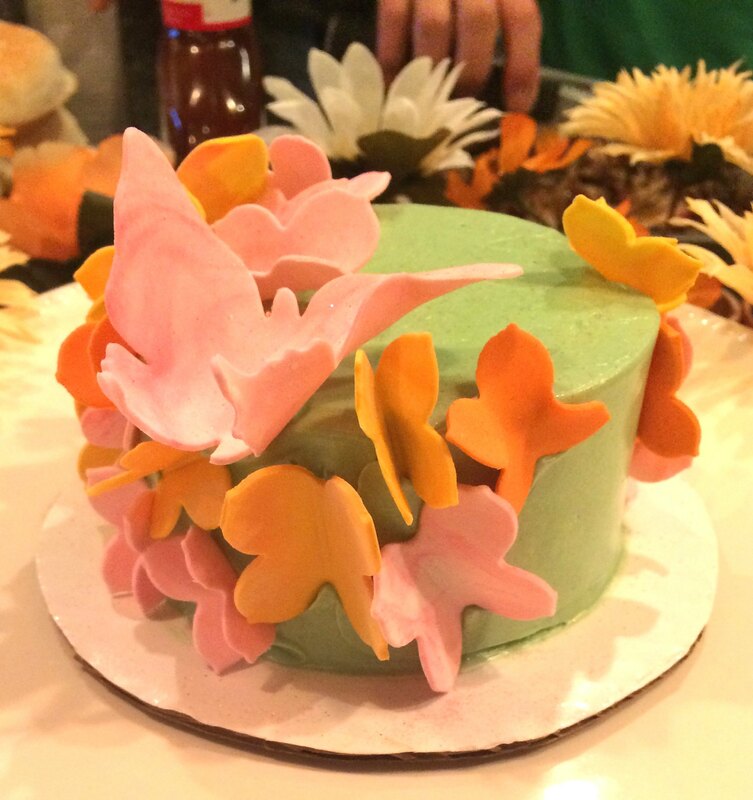 Once again, our favorite baker Kathleen came through with an amazing smash cake. I told her I wanted butterfly/garden theme and sent her a copy of the invitation. This is what she came up with. I love that June ended up a hot green mess at the end of the night. Or watching the looks on their faces when they discovered that amongst the other candy, my mother in law had accidentally bought Warheads. The kids were not amused by this oversight. And finally, the favors. I did little bags of jelly beans held together by a paper clip & some pipe cleaners to make butterflies. And a friend gave me some butterfly bubbles from the dollar store, so I threw those in there too! Favors: jelly bean butterflies in plastic bags with pipe cleaner antennae. 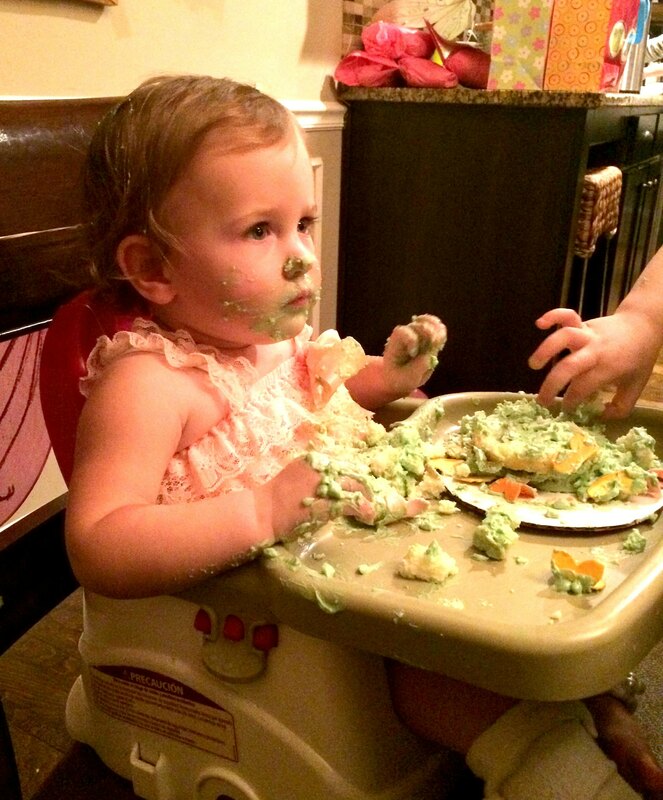 June has been a super serious baby since day 1. 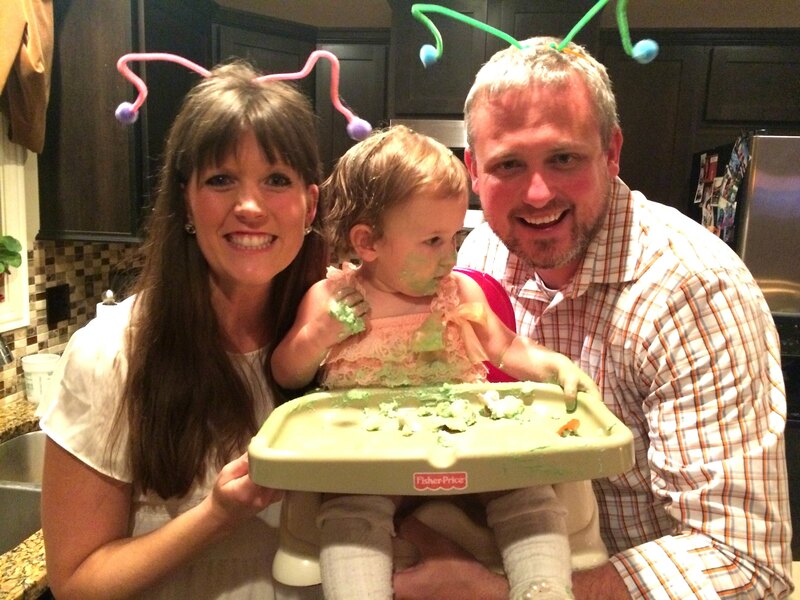 And we joke that she didn’t smile the whole first year of her life. But I kid you not, the kid woke up the day after her birthday party and was all smiles for like a week. I think she was so used to being all go-with-the-flow-third-child, that she finally got some attention and it was like she just came into herself! That was six months ago or so and I really feel like it was a turning point for her with little personality. So, on top of being a creative outlet for me and a great chance to pull friends & family together while creating a fun memory, it also just reminded me how special it is to celebrate children. Not that you have to go all out each time, but it really does impact their little hearts when they know you’re lavishing love and attention on them. 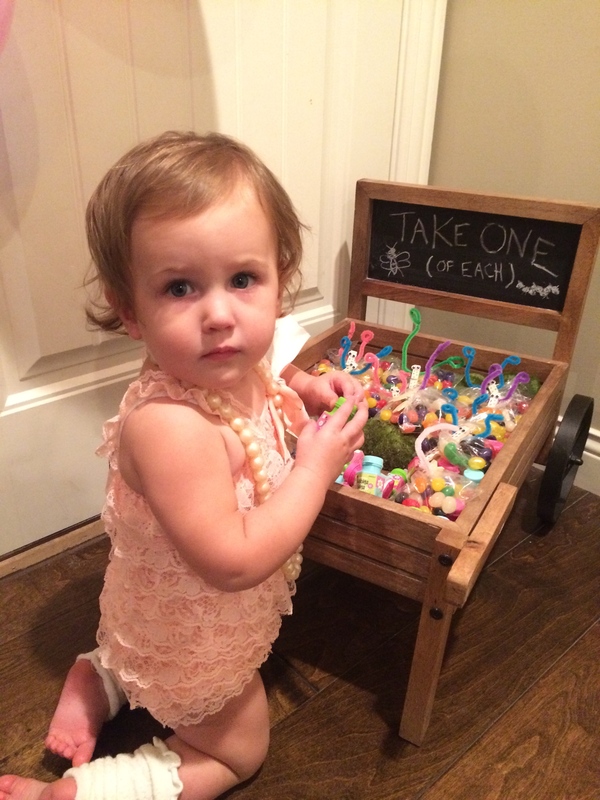 What a precious little gift, our Junebug. 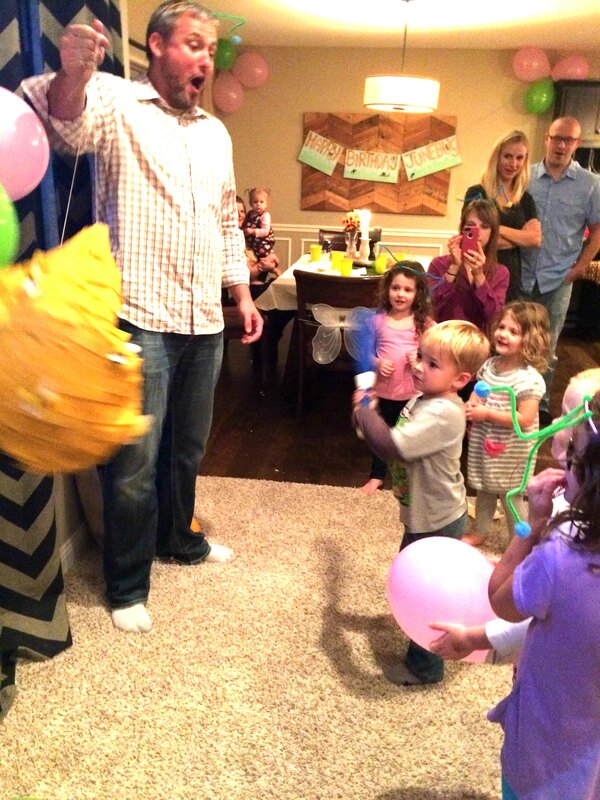 Although a relatively small birthday blunder, it makes me smile thinking about putting Warhead candies in their piñata. 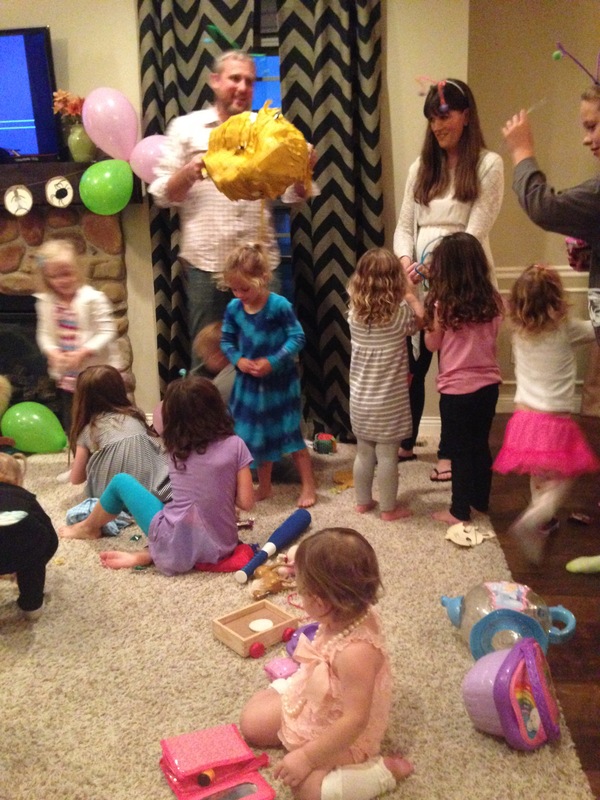 What’s a big or small birthday blunder you can remember from growing up or from your kids’ parties?